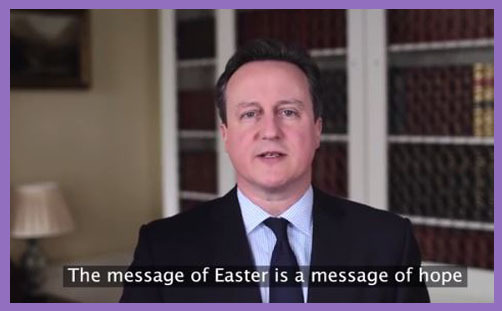 At least No10 bothered to issue an Easter greeting this year. Last year they omitted to do so, and then refused to reply to a number of the politest enquiries as to why the Prime Minister’s website greets Jews during Passover and Rosh Hashanah; and Muslims during Ramadan and Eid (both of them); and Sikhs and Hindus during Vaisakhi and Diwali, but not a word to Christians at Easter. To omit the most important festival in the Church’s calendar seemed odd – especially during a general election year. This year, however, No10 did Easter. The Prime Minister didn’t mention Jesus or the Resurrection, preferring instead to tell us about Christian values – or, rather, his apprehension of them. Christianity was distilled to “responsibility, hard work, charity, compassion and pride in working for the common good and honouring the social obligations we have to one another, to our families and our communities”. These, David Cameron says, are “Christian values and they should give us the confidence to say yes, we are a Christian country and we are proud of it”. It’s probably just coincidence that they also happen to be Jewish values, and Muslim Values, and Hindu values, and Sikh values, and Buddhist values, and, indeed, the values of atheists, agnostics and the UK’s 176,000 Jedi. They are also fundamentally Conservative values. They might even be Labour ones, and even Liberal Democrat ones. Convenient, isn’t it, when Christian values happen to cohere with those of every constituency: either Christianity has triumphed in the secular sphere of ‘core British values’, or it has been syncretised to the point of negation. One no longer expects a British prime minister to talk of Christus Victor or of resurrection power: to expound how the Bible informs political policy is to invite allegations of “nutter”, as Tony Blair once observed. So Easter is “a message of hope”, and Christianity becomes an expression of notions of responsibility, fairness, tolerance and respect. Jesus is reduced to a Citizenship lesson: we must emulate his good manners, his community participation, and his stiff-upper-lip approach to crucifixion. When Christian values become as generic as nebulous core British values, we lose the foundation of our culture. Isn’t the New Testament crucial for constructing a Christian ethic? Don’t its principles guide moral reflection? Aren’t Christian values grounded in the love of God; the love of one’s neighbour; and the exhortation to do unto others as you would want them to do unto you? How can a prophetic religion of love and self-sacrifice be reduced to a stagnant state orthodoxy? Isn’t a biblically-informed faith the critical norm by which culture must be measured? Must we all conform to Cameron’s pragmatic values to be Christian? Isn’t religious liberty a Christian value? Doesn’t that freedom include the right not only to have a faith, but to manifest it and propagate it and witness to it in the public arena? How may one walk in spirit and truth if the law confines them to Sunday? How may one preach the gospel of salvation if the law coerces ‘respect’ for other faiths (that is, religious beliefs; not people)? Did Jesus respect other religions? Was he tolerant of hypocrites, idolaters and blasphemers? Did he honour the rich and those who rode roughshod over the poor and vulnerable? Was he compassionate to those who turned the House of God into a den of thieves? Blessed are the Big Society peacemakers; especially those who want to remain in the EU. The kingdom of a No10 Easter Reception belongs to such as them. TGI Monday: Should we allow Calais Jungle refugees to enter the UK?